Well, I tried making beeswax crayons again and they failed again. Aneliese says that they are getting better and that at least they make color. Thankfully, the cost is minimal so I will try one more time before quitting. But I have been cooking up the squash and pumpkins that are scattered around our house and decided to combine making muffins with art. 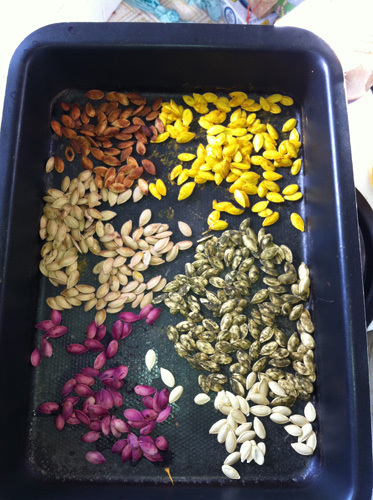 I dyed pumpkin seeds to make a pumpkin seed mosaic. Basically what I did was boil some water with whatever color and the pumpkin seeds for a few minutes, let them cool and then dry. For example, I put a handful of blueberries in the water for purple, about a tsp of tumeric and a dash of baking soda or lemon for the reddish brown and yellow, a bit of oak bark for brown (I think coffee beans or cinnamon would work better), and about tsp of spinach powder for green (didn’t work very well). Some other things to try could be strawberries or raspberries, beets, different teas, and I have even heard that yellow onions with vinegar will make red. Now again, of course you can also use food coloring or paste to achieve your colors and I think you would just do a quick boil with the color and a dash of vinegar. Pumkin seed art amidst the construction zone. Once they are dry, they are ready to be glued onto paper in a mosaic. I just set the girls up with it while Dan and I tried to sneak in an hour of painting (our kitchen!!) and they weren’t quite ready to tackle it on their own. 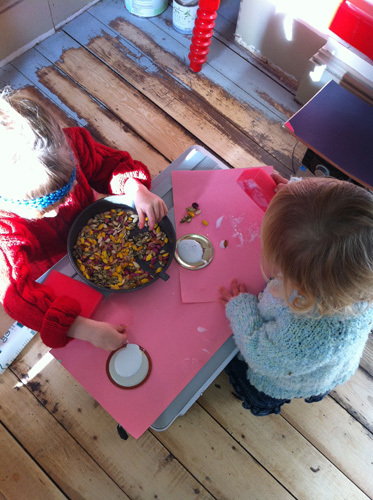 They enjoyed wiping the glue and sticking the seeds on but would have been more successful with some direction. Aneliese did make a heart by using a cookie cutter and adding glue and then seeds inside before getting distracted and pretending that the glue sponge was butter and that she was making food. If you wanted it to be more directed, you could actually print off or draw a shape for them to glue within. Or even have sections marked to be different colors for your child to match the seeds to.